S&P 500 index in the H4 chart reached the level of 2773.4 (Murrey [8/8]). 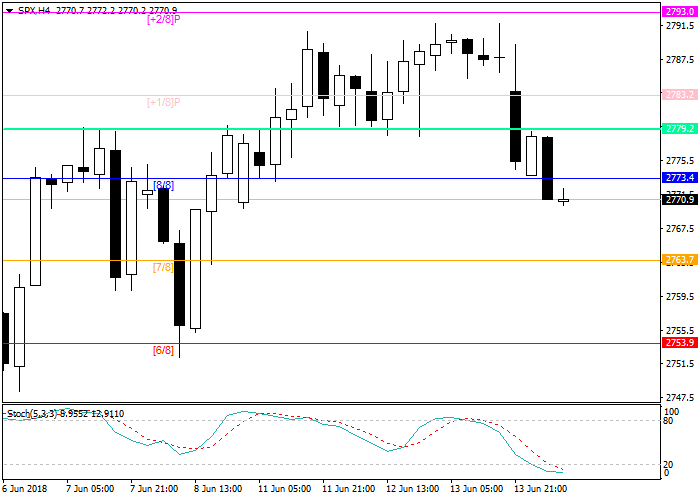 If it is broken down the next target will be 2763.7 (Murrey [7/8]). The decrease may be caused by yesterday's Fed's decision to raise the interest rate by 25 basis points and continue monetary policy tightening. The regulator noted that two more increases could take place this year. The labor market shows records, and unemployment rate remains at a low level of 3.9%, which contributes to economic growth. The Fed predicts that GDP in 2018 will be approximately at the level of 2.8%, which exceeds the previous forecast. Today, investors are waiting for the ECB meeting, after which it may become known how the process of curtailing monetary incentives will occur. At the moment the program is developed only for the period until September 2018 and costs about 30 billion euros every month. As for geopolitics, Donald Trump and Kim Jong-un negotiated in Singapore, where they managed to come to a mutual agreement to begin disarmament of the peninsula. Stochastic is at the level of 15 points and indicates the possible correction. Short positions may be opened from the current level with target at 2753.9 and stop-loss at 2779.2.